On 6 August, IADC, along with the American Petroleum Institute, the Independent Petroleum Association of America, the National Ocean Industries Association, the Offshore Operators Committee, the Petroleum Equipment & Services Association, and the US Oil and Gas Association, jointly submitted comments to the Bureau of Safety & Environmental Enforcement’s (BSEE) May 11th 2018 request for comments on the revision of existing regulations for Well control and Blowout Preventer Systems. The submitted comments were a culmination of an exhaustive review undertaken by an array of highly qualified industry technicians and recognized experts. They contain recommendations for revising BSEE’s well control and blowout preventer systems with a particular focus on sustaining the same level of safety as was implemented when BSEE introduced its initial well control regulations in April 2016. These recommendations significantly enhance the methods and best practices employed in offshore activities. They will alleviate overly restrictive operational constraints that currently don’t contribute to safety, and in some cases increase risk due to certain procedures being compelled merely by regulation and not in keeping with the best available and safest technology. As Director Angelle has stated, “we are committed to the principle of never doing anything that puts offshore workers or the environment at greater risk.” IADC is also committed to a process for the thorough evaluation of offshore risk and ensuring that the most effective and pragmatic provisions are implemented to the benefit of all stakeholders. IADC is pleased to have been witness to the high level of scrutiny exercised on the part of these contributors and the results of their extensive effort. On 29 August, the U.S. Department of Interior (DOI) announced its newly aligned Unified Regions in accordance with its plans to modernize and reorganize the agency in accordance with Executive Order 13781. This initial effort paves the way for DOI to undertake additional measures aimed at creating regional leadership teams, organizing regional activities along six specific activity types and identification of “as is” vs “future State” of operations for each Unified Region. More information can be found at the Department of Interior website. On 15 August, the U.S. Bureau of Ocean Energy Management conducted its most recent lease sale (Sale 251), which offered more than 28 million acres in Federal Waters offshore Texas, Louisiana, Mississippi, Alabama and Florida for oil and gas exploration and development. The auction marks the first since Interior Secretary Zinke stated in April that royalty rates would remain unchanged at 18.75% after previous speculation that the rate would possibly be reduced to 12.5%. Just under 1% of the blocks available for auction, comprising 144 tracts, received bids. More information about the sale can be found on the Department of Interior website. U.S. Senator John Barrasso (R-WY), chairman of the Senate Committee on Environment and Public Works, recently joined with Senators Shelley Moore Capito (R-WV), Jim Inhofe (R-OK) and Steve Daines (R-MT) to introduce the Water Quality Certification Improvement Act of 2018. The bill amends section 401 of the Clean Water Act. The legislation makes several key clarifications to existing law about the appropriate scope of review for a water quality certification. It would also place procedural guardrails and requirements on states as they process requests for certification to prevent future abuses. Require states to inform a project applicant within 90 days whether the states have all of the materials needed to process a certification request. The DRILLERSPAC is now up and running. And the 2018 Mid-Term elections are heating up! The DRILLERSPAC was sanctioned by IADC’s Board of Directors to further IADC’s goal of advocacy engagement with federally elected Members of Congress. The DRILLERSPAC’s mission is to support candidates that support the drilling industry. To date, the DRILLERSPAC has raised $25,000 from 13 individuals and has supported 9 candidates. DRILLERSPAC is not affiliated with any political party. It is organized and conducted on a voluntary, non-partisan basis. DRILLERSPAC is overseen by the PAC Board of Trustees, which is comprised of 10 members – three from offshore companies, three from onshore companies, two from drilling services companies and two IADC employees. For more information, please contact Elizabeth Craddock at Elizabeth.craddock@iadc.org. The U.S. House of Representatives had been on a month long recess. They returned, and following the Labor Day holiday, are now back in session. Sadly, Senator McCain (R-AZ) passed away after his battle with brain cancer. Senator McCain was a war hero, nicknamed the Maverick for his leadership and convictions, and believed in the greatness of the United States of America. He presence will be missed in the U.S. Senate. In August, the Senate was busy passing Appropriations bills and confirming nominations. This month, the Senate is expected to begin confirmation hearings for Judge Kavanaugh, who has been nominated as a Justice for the Supreme Court. The Administration has been very busy in August, despite one-half of Congress being away from DC. Earlier in August, the Affordable Clean Energy (ACE) regulation was announced. This regulation will replace the Obama Clean Power Plan – which restricts carbon emissions from power plants – mainly aimed at coal-fired power plants. In addition, the President announced a preliminary deal with Mexico on the new trade agreement between the two countries that will end NAFTA. Canada, after months of being kept at bay from the negotiations, has now been invited to the table and everyone is waiting to see whether Canada will join along with the details of the new trade agreement. Even if all three countries come to an agreement, the U.S. Congress will still have to approve the deal. The timing of this deal is extremely important: Mexican President Enrique Peña Nieto’s last full day in office is Nov. 30. Under U.S. trade promotion authority, Trump must give 90 days’ notice before signing a trade agreement that he wants to submit to Congress for a straight up-or-down vote, without any amendments. That means the three countries must reach an agreement by Friday, Aug. 31, or Saturday, Sept. 1, if they hope to get it signed by Peña Nieto before he leaves office. IADC recently has the opportunity to visit the training facilities at Maersk Training in Svendborg, getting a close-up look at the state-of-the-art facilities. 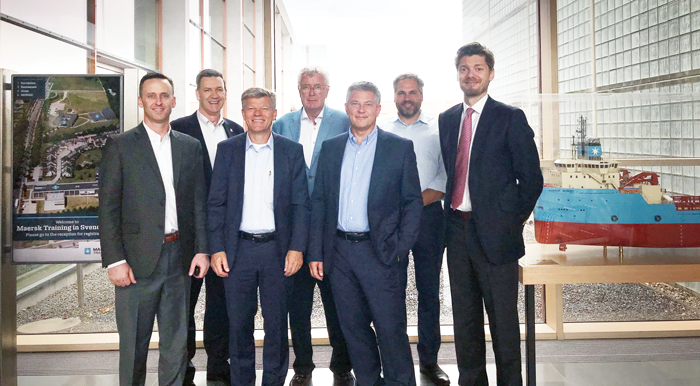 From left are: Jason McFarland, IADC President, Mike DuBose, IADC VP of International Development; Claus Bihl, Maersk Training Senior Advisor; Jens Hoffmark, IADC Regional VP – European Operations; Jan Matthiesen, Maersk Training Group HSEQ & Compliance Officer; Thorbjorn Anhoj, Maersk Training COO; and Johan Uggla, Maersk Training CEO. Australia’s National Offshore Petroleum Safety and Environmental Management Authority (NOPSEMA) recently released its Annual Offshore Performance Report for the year ending 31 December 2017. The report contains data gathered through NOPSEMA’s regulatory functions covering occupational health and safety, well (structural) integrity and environmental management of offshore petroleum facilities and activities in Commonwealth waters. Safety performance for 2017 was encouraging as no fatalities were recorded for the fifth straight year, despite a 31% increase in man-hours worked compared to 2016 figures. 291 dangers occurrences were recorded for the year – the lowest in a decade, though the OCS experienced 29 uncontrolled hydrocarbon releases in 2017, the second consecutive year of increased incidences. The full report can be found at NOPSEMA’s website. On 23 August, the U.S. Bureau of Ocean Energy Management (BOEM) announced the availability of a final Environmental Impact Statement (EIS) addressing the possible environmental impact of activities proposed in Hilcorp Alaska LLC’s Development and Production plan submitted to BOEM in September 2015. The Hilcorp Liberty Project DPP proposes building a nine-acre artificial gravel island in the shallow federal waters of the Beaufort Sea, about 20 miles east of Prudhoe Bay. To be located about five miles off the coast, the facility would be similar to the four oil and gas producing artificial islands currently operating in the area’s state waters: Spy Island, Northstar Island, Endicott Island and Oooguruk Island. Completion of the EIS marks the opening for first-ever oil development in federal Arctic waters. More details can be found at BOEM’s website. The IADC Caspian Chapter hosted a meeting in Baku, Azerbaijan, in February focused on women in the oil and gas industry. The panel included four women in prominent positions in the region. The discussion focused on workplace diversity and ways to support the advancement of women in the oil and gas industry. 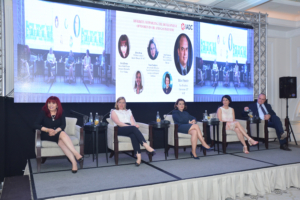 From left are Sevinj Principe, Parker Drilling; Allison Strong, BP; Nargiz Nasrullayeva, State Oil Fund, the sovereign wealth fund of Azerbaijan; and Leyla Novruzova, BP. The UK oil sector safety body, Step Change in Safety, recently announced the appointment of Tamsin Lishman, Asset Director at Spirit Energy and Rob Dyas, Director of Babcock’s UK offshore aviation business, to its Leadership Team. The Leadership Team is responsible for planning and monitoring the activities of the organization, which works to raise oil and gas industry standards and share good safety practice across the UKCS. It includes senior managers and officials from member companies, industry-related trade associations, trade unions, the Health and Safety Executive (HSE), along with the onshore and offshore workforce. Both new members of the Leadership Team bring substantial expertise to their roles in the areas of exploration and production development and aviation safety. More information about the appointments can be found on the Step Change in Safety website. On 15 August, Canada-Newfoundland & Labrador Offshore Petroleum Board (C-NLOPB) released its 26 July 2018 Final Enquiry Report on the SEAROSE Ice Incursion Incident. The summary of findings revealed a failure to fully incorporate and follow ice management and emergency response plans. Additionally, shore-to-vessel miscommunication during the incident hampered the OIM’s ability to accurately assess information and risk associated with the iceberg’s position/heading relative to the vessel. Significant organizational changes and improvement to management processes resulted. To access the full report, please visit the C-NLOPB Website. On 25 July, the Gulf Research Program of the National Academies of Sciences, Engineering, and Medicine announced a new grant opportunity focused on enhancing coastal community resilience and wellbeing in the Gulf of Mexico region. The Gulf Research Program intends to award up to $10 million to projects bringing together researchers and practitioners to collaborate on efforts that increase understanding of how community attributes and systems affect resilience and provide actionable information that can be used to implement policies and practices to enhance resilience. More details about the grant can be found on the National Academies website. On 9 August, the Scottish government announced a new round of funding for decommissioning projects. £5 million has been placed in the Government’s Decommissioning Challenge Fund (DCF) to cover both capital and resource projects. Applications for the latest round are currently being accepted through 28 September 2018. For more information about the DCF, please visit the Scottish Government website. Australia’s National Offshore Petroleum Safety and Environmental Management Authority (NOPSEMA) recently began its review of the occupational health and safety (OHS) regime for offshore petroleum workers in Australian waters. This review is part of NOPSEMA’s continuous regulatory improvement process and is in anticipation of the sunsetting of the current offshore safety regulations, the Offshore Petroleum and Greenhouse Gas Storage (Safety) Regulations 2009, which are set to expire on 1 April 2020. NOPSEMA hosted the first workshop as part of the consultation process on 13 August. The review is expected to be completed by mid-2019. More details about the review can be found at NOPSEMA’s website. On 27 July, the U.S. Coast Guard’s Office of Port and Facility Compliance released its 2017 Annual Report. The report consolidates information provided by each of the 43 Area Maritime Security Committees (AMSCs) established around the nation and focuses on common issues related to challenges, suggestions, accomplishments and best practices. Additionally, the report assists the Coast Guard in devising national strategies to address common problems, emerging threats, validate port specific data, track AMSC activities nationwide, and measure AMSCs alignment with national preparedness goals. The full report can be found at the U.S. Coast Guard website. In January 2018 the National Academies of Sciences, Engineering and Medicine (NAS) convened a workshop that explored best practices and lessons learned from high-risk, high-reliability industries for the benefit of the research community and of citizens, industry practitioners, decision makers and officials addressing safety in the offshore oil industry. NAS recently published The Human Factors of Process Safety and Worker Empowerment in the Offshore Oil Industry, Proceedings of a Workshop, which summarizes the presentation and discussions from the January workshop. The publication can be obtained in hard copy form for $58 USD, or via download and read on line version free of charge. Both can be found on the National Academies website. The International Association of Oil and Gas Producers (IOGP) recently published its flagship data report, the annual Safety Performance Indicators, for 2017. According to reports filed by 45 IOGP member companies, the fatal accident rate in 2017 associated with global upstream operations fell by 36% from the previous year. The number of fatalities decreased from 50 in 2016 to 33 in 2017. This fall occurred during a time when the number of reported work hours increased by 4%. While the number of fatalities was down, the number of fatal incidents increased from 29 in 2016 to 30 in 2017. To access the full report, please visit IOGP’s website. The Brazilian Petroleum, Bas and Biofuels Institute (IBP) and Oil, Gas, Energy Brazil (OGE) recently held the second edition of the Oil and Gas Regulation International Benchmark Forum. The forum gathered specialists from Norway, Canada, UK and Brazil to discuss regulation and is focused on promoting a network of governance in the environmental licensing process, low carbon economy trends and regulatory challenges to broaden the natural gas market. Further details on forum topics discussed can be found on IBP’s website. IADC has moved! The IADC Houston office opened the doors to its new headquarters on 2 July, 2018. The new IADC headquarters is located at 3657 Briarpark Drive, a mere half a mile from the old building. It offers a brand new, custom-designed office space, and modern meeting facilities that offer significant value to IADC’s members. IADC recently launched the new WellSharp Well Servicing Accreditation which replaces the old WellCAP well servicing courses. The new accreditation offers four standalone course options, which include coiled tubing; snubbing; wireline and workover. It also introduces two new courses, which include Subsea Supplement and Oil and Gas Operator Representative Workover & Intervention Well Control. The first WellSharp track, for drilling operations, was launched in 2015. It was the result of an industry-led effort to improve well control training and assessment. Compared with WellCAP, the curriculum puts greater emphasis on risk awareness and assessment. For more information about converting to the new WellSharp Well Servicing Accreditation, please contact IADC’s Accreditation Department. The IADC Drilling Engineers Committee’s 19 September Technology Forum, “Contemporary Challenges in Exploration Drilling,” will take a look at some of the technologies being developed to address the primary challenge that differentiates exploration from development drilling: operational risk. Today’s greatest risk is acknowledged to be within the ultra-deepwater environment, where operators are drilling complex wells with high deviations and narrow mud weight windows. The result is either significant nonproductive time or, in worse cases, elevated well control issues due to swabbing or surging the formation. The Tech Forum will include presentations of technologies that help the industry to improve its decision making and to improve safety and reliability. The event is hosted by Weatherford at its facility at 11909 Spencer Rd in Houston, from 08.00-13.00. Lunch will be provided by Weatherford following adjournment. The front parking area will be cordoned off and identified as RESERVED PARKING for attendees. Please begin parking from east to west (left to right as you enter the parking lot) in this cordoned off area as spots are available. Back-in parking is required. The goal of the Tech Forum is to foster a discussion on how industry is responding to exploration challenges. In addition, spokespersons for DEC joint industry will provide updates on their work. This presentation will provide a review of Deepstar’s past and recent research efforts, with a focus on the current portfolio of projects and opportunities. These include shear ram technologies and a fast fix to SCSSV issues. There are near-term, as well as potentially long-term, implications for making progress on both of these topics, which have generated multiple suggestions for future study that Deepstar members have put forward. This presentation will focus on the use of a new acoustic telemetry system, how it works, and how it is being used to manage risk in deepwater applications from drilling to completion installation. This presentation will examine reasons for the long lead times to introduce new technology into the drilling industry. Even product with great potential to reduce cost and increase safety are rarely adopted with any great speed. This presentation will focus on the experience with one company’s electrical BOP and subsea RCD for riserless drilling. The ability to utilize Wired Drill Pipe (WDP) to enable along-string measurements (ASMs) has been discussed previously. The adoption of this technology at a large scale had been limited due to reliability issues and sensors accuracy, but these challenges have been resolved. The deployment of this new generation of tools on extended offshore campaigns has led to a deeper understanding of flow-off events in real time, such as pack offs, severe losses and FIT/LOT data not normally seen in real time. This presentation focuses on the deployment of the WDP, ASM tools and high-speed telemetry in different offshore exploration drilling applications. Current downhole pressure sensors are unable to detect small density changes that would indicate the onset of inflow from a high-pressure zone. Prototypes of a “fluid density sensor” (FDS) module that could be placed in the bottomhole assembly have been developed and tested in a simulated static wellbore-like test stand with fluids varying from water, salt water (brine) to mud with a density up to 18 ppg. The FDS sensor’s density response was linear over the density range and showed a sensitivity to a wellbore fluid density as low as 0.1 ppg, which would be sufficient for real-time kick detection and well control. This sensor would complement a typical PWD tool, which measures the entire annular pressure gradient from surface to the BHA. The current status of the qualification of the downhole FDS will be presented. Typically, relief well contingency planning is performed on many exploration wells to help understand the feasibility of a kill operation during a worst-case scenario blowout from the target formation during the final hole section. While this evaluation can provide significant value to the design team for the particular hole section of interest, it fails to provide a true complexity assessment of the well design by neglecting to evaluate all potential flow scenarios leading up to the final hole section, as well as after the well has been put on production. A relief well intervention project is often thought by many to occur primarily for blowout events that take place during drilling operations. However, relief wells are rarely utilized in such an occasion. More often, a relief well is used to perform complex P&As where conventional access through the wellhead/tubulars has been lost and conventional P&A methods cannot be used. This understanding can allow for optimization of the well design to further reduce the operational risk throughout the lifecycle of the well. This presentation aims to overview several critical relief well/intervention well design elements, discuss how relief well planning/modeling techniques can be used to analyze the risk profile for a given well and provide methods on how to optimize a proposed well design for intervention well operations. The more uncertain the pressure regime in an exploration well, the higher the value of active and dynamic wellbore pressure management. This presentation describes how closed-system drilling reduces risk to make deepwater drilling more predictable and cost effective. Applications in all phases of well construction in an exploration well will be discussed, as will associated enhanced data collection and the inherent efficiency improvement and cost reductions achievable. To develop a mutually beneficial relationship with suppliers by aligning expectations and promoting performance improvement, the IADC Supply Chain Committee has developed standard supplier metrics and a scorecard. The supplier metrics were evaluated on impact to the supply chain process and the measurability by both suppliers and drilling contractors. These metrics are considered to provide the highest impact to the procurement process and considers safety, quality, delivery and service metrics. Price variance (Service & Parts/Equipment). The standard metrics will be used to create a balanced scorecard that drillers can share with suppliers so they understand the driller’s priorities and expectations, and are relevant and meaningful with their areas of expertise and business. The IADC Advanced Rig Technology Committee Drilling Controls Subcommittee is looking for drilling contractor input on codes and subcodes being updated and defined for the IADC Daily Drilling Report (DDR). Currently, the DDR features 23 main codes. A DCS work group is bolstering these with subcodes drawn from multiple sources for publication as an IADC best practice guidelines. No changes are envisioned for the 23 main codes, other than improved definitions. Use of the new set of subcodes will be voluntary. The subcodes would be included in an enhanced IADC electronic DDR, with the ability to substitute alternative or additional codes. To participate, and have your voice heard, contact David Shackleton, IDS (dshackleton@idsdatanet.com) and John de Wardt, DE WARDT & COMPANY (john@dewardt.com). The IADC Advanced Rig Technology (ART) Spark Tank was held on Thursday, 16 August, 2018 at IADC’s Houston headquarters. The mission of the IADC ART Spark Tank is to provide opportunity to provide technology entrepreneurs an opportunity to pitch their products and ideas (“Sparks”) to a panel of drilling contractors and operators (“Sharks”). The purpose is to provide insights to technology developers into what matters to those they are innovating for. Only Sharks ask questions of the presenters. Speakers had 15 minutes to present, with 15 minutes allotted for Sharks’ Q&A. 9:15 “Rider 360: Integrating, Visualizing and Operationalizing Your Asset Data”: Cason Swindle, Context Associates Inc. The Rider 360 platform delivers on the promise of the digital oilfield revolution by integrating equipment, workforce and process performance data into a single platform, then displaying the analysis of the data as a 360 view of rig operations in real time so teams can perform more safely and more productively. In our Spark Tank presentation, we will share the technology and benefits of the Rider 360 platform for Drilling Contractors and Operators. Benefits include integration of equipment, workforce and process performance data, as well as visualized data and analysis. 9:45 “BTX Integral Casing”: Sealy Morris, RDT Inc.
RDT wanted to design a semi-premium joint of casing to drill, ream, rotate like drill pipe with no special handling considerations. We wanted a connection that was interchangeable with standard API threads (BT&C & LT&C) but wanted a higher make up torque. The end result was an integral design where we eliminated the need for a coupling. This was achieved by upsetting one end to old or new API coupling dimensions. The torque rating is 50% higher than standard API connection, but interchangeable. This presentation will discuss details and advantages. 10:30 “Improving Wellsite Safety And Efficiency Through Wireless Measurement Technology”: Jim Profit, Strainstall UK Ltd.
Wellsite operations require many forms of real-time load and pressure monitoring. As most current load cells transmit data by wire, their cables can represent tripping hazards for operatives, while breakages are a common cause of NPT. This presentation outlines the benefits in safety and well site efficiency that can be leveraged by implementing wireless measurement technology and Internet of Things (IoT) style data capture and processing, leveraging the data generated from multiple sources. These technologies can make the work site safer for operatives, reduce costs and improve efficiency, while increasing the accuracy of load measurement and providing robust archiving of data for subsequent processing. Eventually all bits wear out. The cutting discs become dull and less and less effective, and require changing out the bit, a time-consuming and expensive process involving pulling the entire drill string, replacing the bit, and running the string back downhole. A new solution is build bits with disposable worn tips that can be shed to new sharp tips to continue an efficient drilling process without pulling the whole drill string out of the drill hole. Saving the turn-around cycle would save days per week of unproductive time. This presentation will discuss the details of this novel technology. The IADC Cybersecurity Committee recently posted minutes from its 9 August meeting. The Committee is working to draft the IADC Cybersecurity Guidelines on Network Segmentations document, and is seeking volunteers to participate in drafting the guidelines. Please contact Siv Hilde Houmb at sivhoumb@securenok.com or Melissa Mejias at Melissa.Mejias@iadc.org if you would to participate. The next IADC Cybersecurity Committee Meeting will be held from 9 to 11 a.m. on 11 October at IADC’s new Houston headquarters, 3657 Briarpark Drive, Suite 200. If you plan to attend, please register online. The Committee will host an IADC Cybersecurity Workshop at the BP Headquarters in Houston on 13 December. More information about the Workshop will be forthcoming. For more information about the Committee, please visit the IADC Website. IADC Drilling Matters, the Association’s multimedia educational tool, has posted several exciting new modules to help dispel myths and misconceptions about the oil and gas industry. “Drilling It Safely” reveals that oil and gas industry is one of the safest industries for workers, and getting safer all the time. The 2:18 minute video presents US government statistics clearly demonstrating that workers in oil and gas are far safer than those in manufacturing, coal mining, construction, or general private industry. Further, worker injuries have plummeted 45 percent in oil and gas. Through strong programs of worker training, a laser focus on safety and building strong safety cultures, and advanced technology, the oil and gas industry stands as one of world’s safest. The 15-minute module “The Challenge and Rewards in Deepwater” discuss the development of sophisticated technology, processes and equipment has enabled the oil and gas industry to expand offshore development moving into increasingly deeper waters. Modern offshore drilling and production uses equipment and techniques that are as far from those Nineteenth Century platforms as the International Space Station is from the Wright Brothers’ Kitty Hawk airplane. Today’s safety provisions and management systems are designed to ensure that drilling and production operations in deepwater meet the highest standards. “Renewables: Did You Know?” is a documentary on the dark side of renewable energy sources, issues related to pollution, serious safety hazards, habitat destruction, and land degradation. The 8:18 minute video reveals that mining the rare-earth metals required for wind turbines and batteries for electric cars produces five times more waste gas than all the miners and oil refiners in the U.S. and produces thirteen billion meters of gas and twenty-five million tons of wastewater laden with carcinogenic metals. In addition to this severe pollution, these materials also hide a dark story of child labor and abusive working conditions. Overall, battery powered electric vehicles generate more than three times as much human toxicity as an equivalent internal combustion-engine vehicle. “Coal: Did You Know?” explores the shocking environmental and health impacts of coal as a fuel for electrical power plants. As this 3:07 minute video shows, emissions of hazardous emissions and CO2 greatly exceed those of oil or natural gas, including chemicals that react in the air to produce acid rain. Further, coal mining often results in the removal of entire mountaintops. In addition, ash produced by murbing coal is collected in ponds, and contaminates nearby surface and ground water. Even worse, the dams on these ponds can burst and overflow, pouring toxic sludge into rivers and even neighborhoods. Meanwhile, an 8:16 minute documentary explains “Hydrocarbons in the 21st Century: Green, Clean, and Safe”. The module explains that today’s advanced drilling equipment and techniques ensure that the world’s oil and gas wells can be drilled safely and with minimum impact to the environment. In other Drilling Matters news, IADC Group VP/Publisher Mike Killalea was invited to speak during August about the project at SPE’s workshop “Enhancing HSE Performance for Drilling Operations”, which was endorsed by IADC. IADC Director, Government & Industry Affairs – Onshore Rhett Winter chaired the session. For information about Drilling Matters, contact Mr Killalea at Mike.Killalea@iadc.org. The International Association of Geophysical Contractors (IAGC) and IADC will jointly host a workshop on Thursday, 25 October titled, “IAGC-IADC MMPA/Offshore Legal Issues Workshop” from 1:30 to 4:30 p.m. in Houston. For more details and to register, please visit the IAGC Website. The IADC Houston Chapter will host its second annual Christmas gala on 1 December 2018 at the Petroleum Club of Houston. The event will begin at 7 p.m. and will feature music, photo booth, caricature artist and a visit from Old St. Nick. Attendance is limited to 200 guests who register to attend in advance. For more information, please email houchaptergala@adventfirm.com. Component of the equipment through which the primary load is carried. Innovation Paths Training Center, Saudi Arabia. Weatherford Drlg Int’l: Rig 144 (17); Rig 811 (7); Rig 875 (4); Algeria Support Team (3); Kuwait Support Team (3). Weatherford Drlg Int’l: Rig 3 (1); Rig 40 (3); Rig 151 (2); Rig 798 (1); Rig 811 (3); Rig 828 (1); Rig 875 (1); Algeria Support Team (3); Kuwait Support Team (5); Kuwait Support Team (1).